"In a game when points are at such a premium, even the smallest of runs can be game-changers. 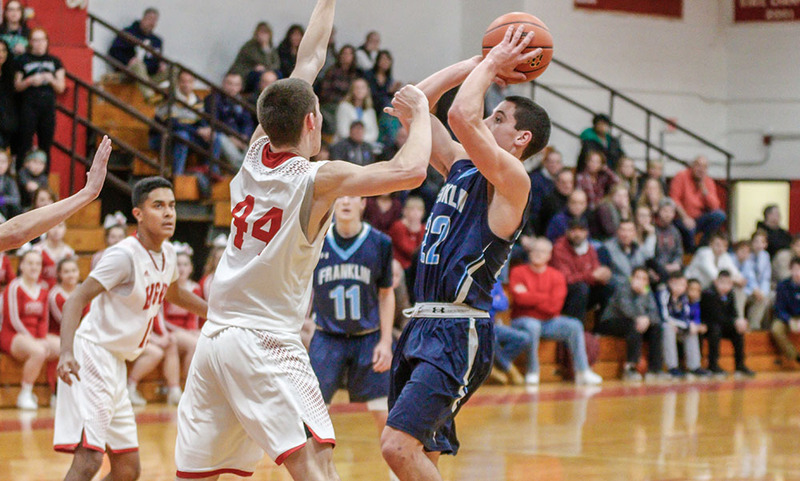 Franklin used a pair of those short spurts to create enough separation and delivered a signature tough defensive effort in a 45-28 win over North Attleboro. With both squads playing their best on the defensive end, points were especially hard to come by early on. Franklin’s first field goal came with 6:31 left in the first quarter, and North tied it with 3:41 to play as the teams combined for just four points over the opening six minutes. But in the last two minutes of the opening frame, Franklin’s offense came to life with an 8-0 run. Sophomore Chris Edgehill (eight points) drained a step back three and hit one of two free throws to start the run. Paul Rudolph scored in transition and Matt Elias converted an offensive rebound shortly before the buzzer to give the Panthers a 10-2 lead after one."